Missing teeth can have many serious consequences. Remaining teeth can begin to move into the empty spaces left behind, and the jawbone can start to deteriorate. Meanwhile, eating and speaking become much more difficult. For patients who are missing the entire upper or lower arch of teeth, implant-supported dentures are the very best solution. These special dentures attach directly to titanium or ceramic posts implanted directly into the jaw bone. Drs. Donald Ross, David Kim and Neal Shah offer this advanced solution because it not only restores aesthetics, but also maintains dental alignment, prevents jawbone atrophy, and helps patients chew, speak, and smile with confidence. 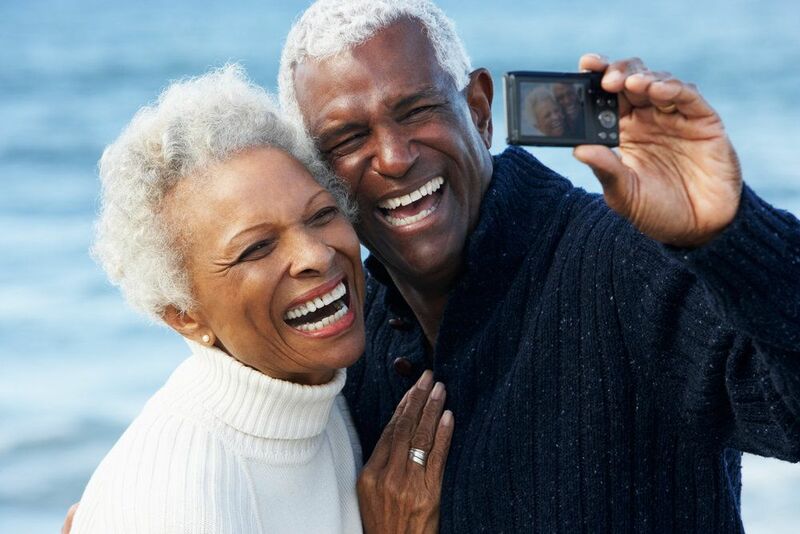 If you are missing teeth and would like to learn more about the many benefits of implant-supported dentures, please contact our Atlanta, GA, office to make an appointment with one of our doctors. Following tooth loss, the jawbone no longer receives stimulation from the tooth roots. This prompts the body to begin distributing the surrounding bone cells elsewhere, causing the jaw to atrophy, or shrink. The body perceives dental implants as natural tooth roots, and they are the one and only solution that can stop jaw atrophy. In some cases, they can actually reverse mild atrophy. Traditional dentures rest on the gums and depend on dental adhesives to remain in place. Over time, traditional dentures can wear down the gingival tissue and result in “shrinking gums”. Meanwhile, the jaw will continue to atrophy, and will require regular adjustments to achieve a proper fit. Implant-supported dentures, on the other hand, maintain the shape and bone density of your jaw, and will need far fewer, if any, adjustments. Because implant-supported dentures are anchored directly to the jaw, there is no need to worry about them slipping or falling out of place. You can take a big bite out of an apple, chew rare steak, or deliver a speech without having to think twice about your dentures shifting. Implant-supported dentures also fit better than traditional dentures. Implant-supported dentures are secured into their ideal position permanently, which provides a fit that is comparable to natural teeth. Today’s dentures can be made from extremely lifelike materials that look and feel virtually identical to natural teeth. Restorations made from porcelain or zirconia can mimic the translucency and light refracting qualities of your natural teeth. They are also extremely durable. The skilled technicians in our partnering dental laboratory will match the color of your dentures to any existing natural teeth for a seamless integration into your smile. If you have missing teeth, and have been recommended for dentures, dental implants could be one of the wisest investments you ever make. They not only benefit your health, confidence, and quality of life, but can also last the rest of your life with proper care. Please contact our office to schedule a consultation with one of our doctors.